Perplexing questions ranging from jeans to jockeys. 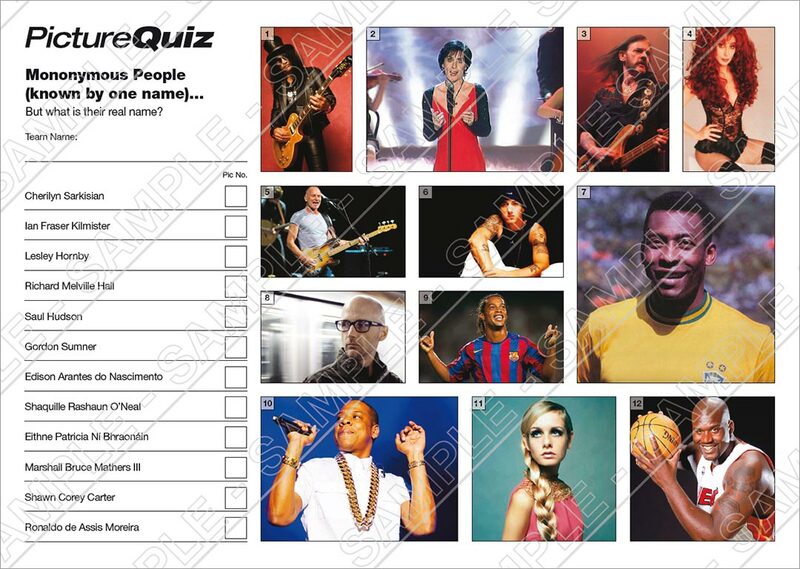 The Picture Round is Mononymous People and the Wild Card is on Hot Chocolate Singer lookalike, ex footballer Dion Dublin. Q03. Which European town is the material denim named after? Q15. Rough Boy was a top 30 hit for which American trio in 1985? Q29. Nick Hancock was the host of which BBC TV sports show? Q38. In the classic 1983 John Carpenter film Christine… what was Christine? Here’s a low-res sample of the Mononymous People Picture Round, click for a higher resolution version. The Picture Round download is a two page high quality PDF with the answers on page 2. The Wild Card for Quiz 013 is a footy based question on that Hot Chocolate Singer lookalike ex-footballer Dion Dublin.